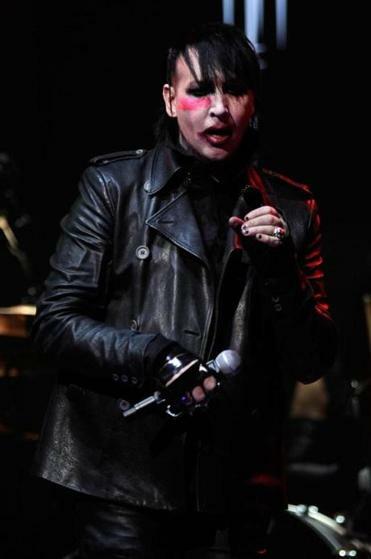 Marilyn Manson (pictured in LA in 2012) played fan favorites and more at the House of Blues. More than two decades in, Marilyn Manson may no longer possess the ability to provoke shock and outrage, the two responses that the singer and his identically named band so eagerly pursued from the American public. But anyone doubting the hold he still has on his fanbase in 2015 need only have looked to the House of Blues on Wednesday, where folks were lined up halfway down Lansdowne Street in subfreezing temperatures less than 24 hours after a region-crippling blizzard. If Manson wasn’t canceling on them, they weren’t canceling on him. And while Manson would never go quite so far as to be effusively grateful, he nonetheless seemed pleased at the turnout. For all of his strenuous efforts at transgression, the unifying theme was one of unity and self-valuation. “You are not a thing,” he intoned at one point. And while the methods are different — more Druidic robes and quasi-SS outfits, for starters — that’s not a message altogether different from the one offered by Lady Gaga. The music was another story. “mOBSCENE,” “Disposable Teens,” and plenty of others hit with the impact (and nuance) of a wrecking ball, while “This Is the New [Expletive],” with its disruptive drums providing an unusually effective rhythmic hook, was more corrosive. But no matter how thudding and metallic the songs were, they were almost uniformly tuneful, and the hard shuffle that ran like a thread through the beat gave plenty of them a decadent swing. Manson leaned into it, with an unaggressive loucheness underlying his performance. On songs like “Killing Strangers” and “No Reflection,” he sang as though his mouth alone was drunk, and he countered the slashing guitars of “Rock Is Dead” with a slack, loose-limbed posture. Manson’s imagination had its limits. His cover of “Sweet Dreams (Are Made of This)” had nowhere to go after the first chorus, but went there two or three more times anyway. And “Irresponsible Hate Anthem” wasn’t irresponsible or hateful, just loud, screamy and repetitive. But he more than compensated with “Third Day of a Seven Day Binge,” a grinding, minor-key pop song with enough room to breathe that it wasn’t just visceral, but also genuinely affecting. And when he finally resorted to shrieking, it was earned catharsis for once. Sounding like a thousand people howling a mile off in the distance, local industrial doom hard-core band Sadist ran out of tricks well before its 20-minute opening set was over.